Mr. Marcos Moraes’ works may look all fun and cute (and they are indeed, playful, vibrant and visually entertaining), but he is one of genuine talent and uncompromising discipline. He is inventive and knows the industry inside out. Mr. Moraes has wisdom to offer and does not shy away from it. he understands industry innovations and can handle them efficiently. And what’s really good about him is that he lets himself explore and embrace the innovation, thus moving not only his trade forward but ultimately his skill and status as an artist of repute. Needless to say, Xeno Creatives admires Mr. Marcos Moraes. He is everything that artists should be defined by: talent, tenacity, flexibility, and adaptability–all without having to commodify what he is passionate about. Marcos Moraes (MM): Well, I must say that curiosity was what motivated me. I have always been a self-taught kind of guy and when I discovered ZBrush, my working perspectives have totally changed from that point. I’ve watched a lot of YouTube videos to learn what I couldn’t figure out by myself and I spent a lot of time doing tests to understand the software. XC: As a dedicated artist, how did ZBrush help you further your art? 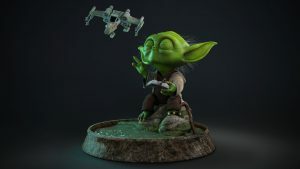 MM: ZBrush is the most popular software these days to sculpt as you sculpt in the traditional way or as close as it is possible. So it is clear the reason why it is so popular. There are many people online showing their amazing works on forums and websites like ArtStation and on Facebook groups like the Pixologic ZBrush so, when you show your work online using hashtags, talking about your process, and mentioning ZBrush, the feedback is generally very positive. 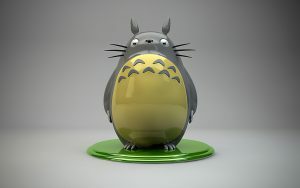 The creative community loves ZBrush and likes to share works that were made using the software. XC: What made you decide to focus on ZBrush as a medium for 3D art creation? Are you still planning on venturing into other software? MM: I used to sculpt and illustrate the traditional way. When I discovered ZBrush, I realized that I could merge two things in one: drawing and sculpting at the same time in one amazing software. That blew my mind! I use ZBrush every day. I also use other software to render like Keyshot, but for characters, I like to use 3Ds Max because the shader system is very friendly and easy to manipulate, at least for me. MM: I believe when you are working on characters, even in cartoon style, all the anatomy knowledge you have can be very useful. Creatures, even if fully invented, have physical structures and some knowledge of anatomy will be necessary to make the work more realistic. XC: Do you see yourself working in the movie and television industry? MM: I have been working with 3D for 6 years, I have started in Archviz industry and after I figured out that it was not what I was seeking for, I discovered that creating characters or even working on look development was what I want. I am working on my portfolio now, I still have a lot of work to do, and I do not discard any possibility. I want to participate in a production, an animated film. So, the answer is yes. XC: Was your craft really a passion to begin with or just a job? MM: Passion… a huge passion! I really love 3D work and despite being a beginner in characters development, I just love 3D. I am studying for days, a few hours per day, even on weekends because I want to be very good at it but not just for the money–it is because I really love what I do. XC: Seeing your works online was a visual treat! Do you have favorite pieces? What are they and why? MM: It feels very good when you know your work is appreciated. I love Eleven. 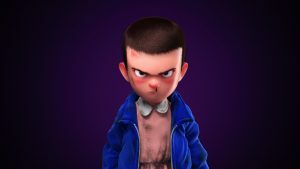 My friend Bruno Mota is a Brazilian illustrator and he did this fanart of Eleven in Cartoon Style. I asked him if I could do a 3D version. It was a great pleasure to work on this character. I am a great fan of “Stranger Things”, so it was fun doing that. MM: I’m a big fan of Pedro Conti, Glauco Longhi, Rafael Grassetti, Victor Hugo, Natalia Freitas, Guzz Soares and other great guys out there but I’m doing cartoon characters lately, so Pedro Conti is a big influence to me. He inspires me a lot. The style of his job is very catching. They are all Brazilian but I like guys such as Randy Bishop, Nico Marlet, Chris Sanders. Those character designers are very inspiring. XC: What other pieces do you want to create? MM: I want to include in my portfolio some realistic models too. I love Superheroes and I am working on a realistic Batman model. I also want to create some robots and some spaceships in cartoon style. XC: Aside from creating fan art and your own amazing character concepts, do you also see yourself getting involved in Game Character Design? MM: Yes. I am very interested in working with games too. The knowledge and experience would be very valuable. The development pipeline of a game interests me a lot. XC: you weren’t working as a 3D artist, what do you think you’d be specializing in instead? MM: I have no idea. Art has been a part of me since I was a kid. Without that I really don’t know. Teach history of art could be an option. XC: What advice can you give individuals wanting to enter the industry? MM: Study, work, study, work, and work a little more. 3D is very difficult. You must be totally in love with it to achieve your goals. Some 3D areas are simpler but character design is difficult. You must have some skills, if you don’t, work hard. Everything is possible, you just need to roll up your sleeves and work a lot. Pay attention to the great guys in the industry, observation is a very powerful tool. Never give up and remember: it’s not about what software you are using but how you handle the tool. Mr. Marcos Moraes, we are indeed grateful for the opportunity of an interview. We wish you all the success in the trade! May you keep producing art that you love through a software that you love. Want to see more of Mr. Marcos Moraes’ AWESOME works? Click here!